We live in the century of energy. Though we we may not realize it, how we use energy, the sources we derive it from, and who controls these sources are already defining our politics, our wars, our economies, and our very standard of living. To comprehend the shifting fortunes of the energy landscape that even now determine how we get to the grocery store and how we heat our homes, it’s interesting to examine the per capita oil consumption of countries around the world. Last October I reported that Per Capita Oil Consumption is Dropping Like a Rock (In Some Countries). Let’s wade into these murky waters once again to see what the last release of International Energy Agency data can tell us. Now although the US is becoming more efficient with its BOOPPPY, other countries are way ahead of us on this score. Germany only used 10.5 BOOPPPY, while Japan used 13.5. China, whose economic output has been soaring the past decade, consumed only 2.65 BOOPPPY! This is likely because the US uses 70% of the oil it consumes for transportation, one of the least productive economic uses we can put it to (since internal combustion engines waste most of oil’s energy as heat.) Germany uses only 50% of its oil for transportation, Japan 45% (probably less now, because since the tsunami they are using more oil for electricity production), and China 40%. But even though China’s BOOPPPY is rising slowly every year, even though per person oil use in the US and Germany is falling, and even though Japan’s BOOPPPY has popped up due to shutting down their nuclear power plants, on the whole the big four aren’t nearly as interesting as what’s happening in parts of Europe. This where our drama lies. However, before the theatrics, let’s examine the stable, snowy, no drama countries—Switzerland, Sweden, Denmark, Austria and Finland. These wealthy countries all use close to half the oil per person as the US. 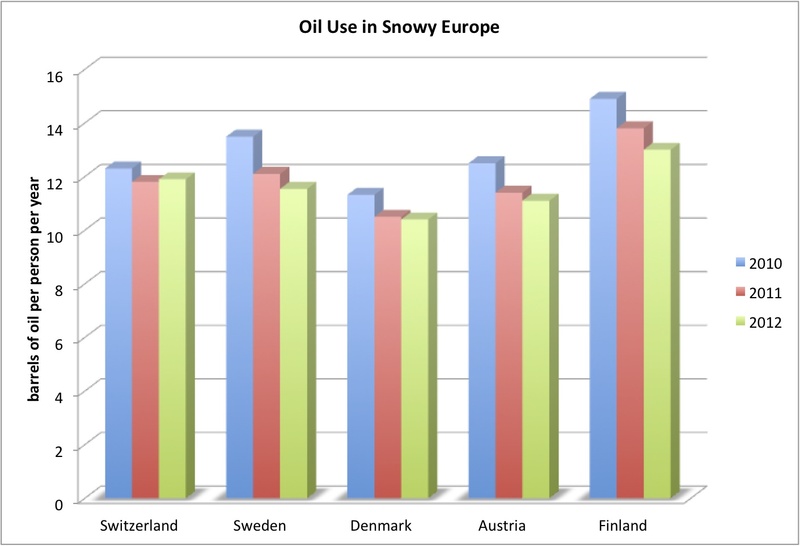 In the past few years they’ve moderately dropped their use, Finland the most aggressively. (Of course Finland was the highest to start with.) Their gradual reduction in oil use is mostly likely to due increases in efficiency and public transportation--signs of societal investment. As such, falling oil consumption can be read as an indication of strength. Now let’s look at the UK, France, Italy and Spain. Wow. These are advanced, complex economies that along with Germany make up the core of the EU. Remember, at this stage in the world’s energy evolution, it is no easy feat to run an advanced economy with less than 10 BOOPPPY, and yet these countries have plunged well below. 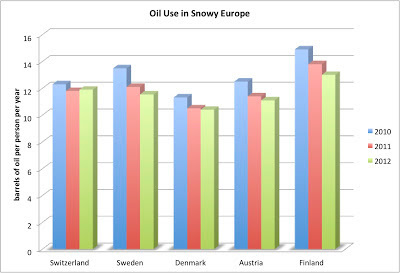 Oil use that in 2010 was already frugal, even by European standards, has become positively parsimonious. The IEA data I’ve derived BOOPPPY from are yearly averages, which, by their very nature, change slowly and smooth out seasonal variation. 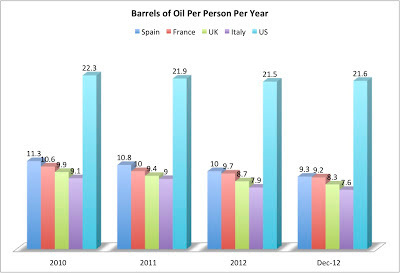 But for this graph I’ve included numbers from the month of December 2012 to give us an indication of the direction oil use might be taking. It tells us a pretty amazing story: UK—8.3, France 9.2, Italy 7.6, and Spain 9.3. For comparison’s sake, Mexico’s number is currently 6.7. Brazil is running around 6. 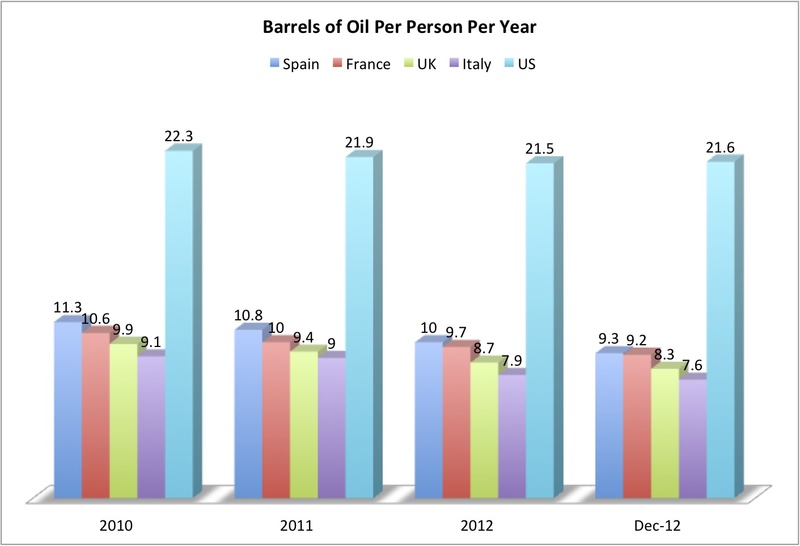 Think about it: Italy is now using close to one third of the oil per person as the US. And Italy is a country where people love their cars and have lots of them. In 2001 their BOOPPPY was 13.6. While I would like to think the drop in oil use in the UK, France, Italy and Spain is due to recent social investment in public transit and efficiency, I suspect it’s more likely due to substantial economic pain. Significantly, the less oil each country imports (without reducing their economic productivity), the better their balance of payments, and the better their financial straits become. Because these countries have had trains and transit for decades, now, when their economies are sputtering, their populations are able to forgo oil, allowing money to be spent on other things. I don't think it's an easy transition, but because of previous investment, at least it's a possible one. There are some other economies in dire financial straits that are curiously still spending lots of money on oil per person. Let’s look at Greece and Ireland. Both countries import all their oil. Both have economies that are flailing. For Greece, at least, the US media tells story after story of extreme economic hardship. But three years ago the BOOPPPY numbers of Greece and Ireland were higher than the four wealthier countries we just looked at, and while they’ve fallen, they’re still higher. Right now they’re consuming oil per person at the levels of Denmark and Germany. Is Greece a wealthier country than Italy? Is Ireland a wealthier country than the UK? Why haven’t the economies of Ireland and Greece responded to economic pain by reducing oil use below that of their wealthier neighbors? 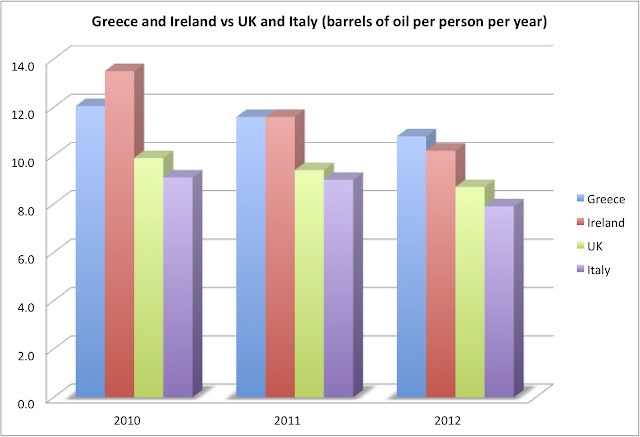 Is their inability to reduce their oil use to UK and Italian levels making their plight even worse? Some final questions: how long can the US continue to use oil at a per person rate double, triple and even quintuple that of just about everyone else on the planet, including our strongest economic competitors? If the price of oil on the world market climbs, who is hurt more, countries with high BOOPPPY or low? If (or as) our economy sputters, do we become more competitive by maintaining or by reducing our rate of oil consumption? One thing is obvious: if consumption in the EU weren’t falling like a rock, world oil prices and the price we pay for gasoline would be a great deal higher. nice post, and some interesting questions. As businesses, they can of course claim back the VAT on car purchases (20% of the retail price), and they "need" a new car because "clients expect them to look prosperous". A 20% "discount" makes a new car look cheap, if you've been an employee and had to pay full price all your adult life. Coppola's explanation of the UK's "productivity puzzle" also seems to explain the car sales puzzle. On the BOOPPPY thing, oil use is closely related to the size of the working age population. (Retired people use much less oil than do workers, but they still count in the population numbers.) So part of the BOOPPPY decline in rich countries is simply due to ageing. In contrast to nearly all of Europe, the USA's working-age population is still growing, although it is just starting to shrink as a percentage of the whole population. So the USA's BOOPPY should be starting to decline. 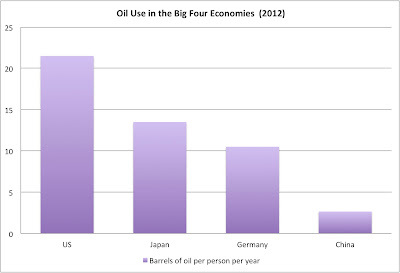 Since Americans use so much oil, the decline should be steep when it gets under way. The UN has handy, though small, charts of working age population at http://esa.un.org/unpd/wpp/country-profiles/country-profiles_1.htm (look at the top right-hand chart). Just to add the UK car financing model with large residual payments after 3 or 4 year term means some people have to trade in for a new model at the end of the lease. Car salesmen have target lists of people coming to the end of a lease and the offer of a new car for only a small monthly payment and nothing down is too attractive to most. Business/self employed leases are even more structured this way as the lease company wants the car back to sell so does not want the lease to run for too long. The UK business 'benefit in kind' tax charges and annual VED are linked to emissions so there has been a relentless drive for more efficiency and for many self employed 'consultants' a new Prius will be cheaper overall than a 3 year old standard car (service costs rise with age and miles) mainly due to the massive taxation on fuel (£1.50 a liter and rising) for which only some of the value added tax (20%) can be reclaimed for company cars not the duty and, for most people, own car business miles have a fixed price per mile recoverable under HMRC given rates (max about £0.45 per mile for first 10,000 miles). Allowable business miles recovery for 10,000 miles £4,500 (can be taken as an expense from the company tax free if you own the car personally). BMW owner will have spent about £3,300 at the pumps leaving £1,200 expense 'profit' to fund the car, insurance etc. Prius owner about £1,100 leaving £3,200 which is roughly the annual lease cost.